I love this time of year for lots of different reasons…. crisp air, twinkling lights in the night, and giving to others! I absolutely love to surprise friends and family with a homemade gift! 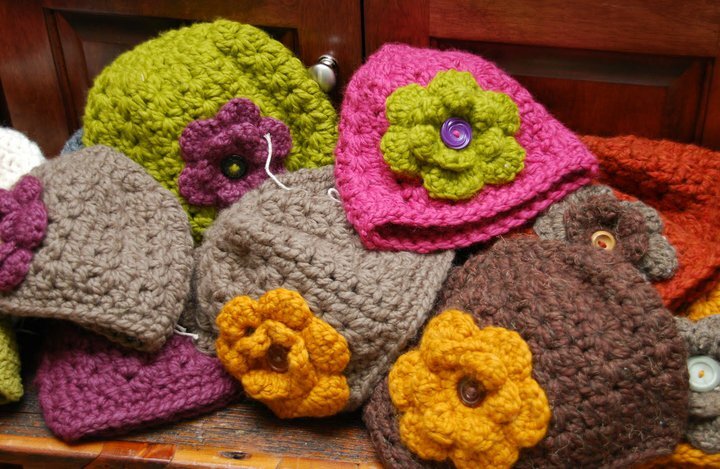 I’m getting my “to-make” list together as we speak…..
One of my favorite gifts to give has been hand made crocheted hats. These chunky hats are created from a thick wool blend yarn (20% wool / 80% acrylic) that’s nice and toasty! A funky flower with a vintage button center completes the look. I am taking custom orders for hats for holiday giving for yourself or others. And…. When you need it! . . . . . . . . . . PRICES . . . . . . . . . . Shipping can be combined on multiple orders.
. . . . . . . . . .PAYMENT INFORMATION . . . . . . . . . .
. . . . . . . . . . CARE INSTRUCTIONS . . . . . . . . . .
Love these! Wish I had more girls to buy for! I’ll have to look at my Christmas list… which I haven’t started yet! You’ll have busy hands the next few weeks!